The drone manufacturer's stock price came under pressure last month. Shares in AeroVironment (NASDAQ:AVAV) dropped 19.8% in October according to data provided by S&P Global Market Intelligence. Given that there wasn't any significant event from a fundamental perspective in the month, it's fair to argue that the move is likely to be a consequence of the general market malaise in October. Indeed, if you actually look at AeroVironment's stock performance since the day before the company's first-quarter 2019 results (on Sept. 5), the stock is actually up 6.8% compared to the S&P 500 index. The earnings were well received by the market, as the stock popped 17% on the news, so it doesn't look like there's any fundamental weakness in the business. In fact, the earnings report showed a company more than doubling its backlog to $157 million, but considering that management expects $290 million to $310 of revenue in fiscal 2019, it's a good idea to keep an eye out for news. For reference, the company announced a $5.9 million contract for unmanned aircraft systems (drones to you and me) in mid-September and a $13 million contract with the United States Air Force in October. Valuations do matter, and so do movements. Given any kind of general market correction, it's likely to be stocks like AeroVironment that get sold off the most. As you can see below, the company priced for growth, and when the market decides to take risk off the table, stocks like AeroVironment will get hit first. 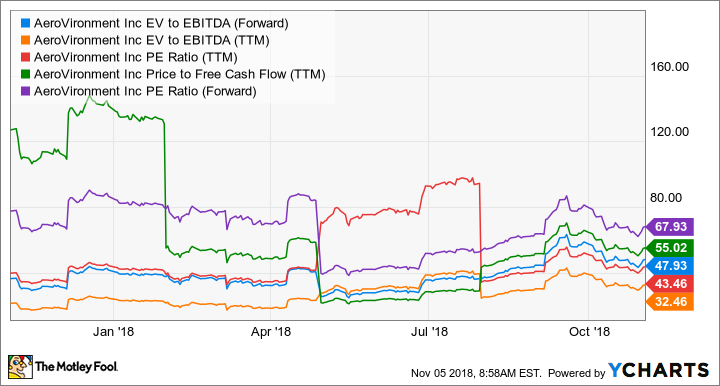 AVAV EV to EBITDA (Forward) data by YCharts. That said, and as noted earlier, if the company's fundamentals are supportive of the idea that AeroVironment can generate long-term growth from sales of its unmanned aircraft systems and tactical missile systems, shareholders are likely to be rewarded. Investors who believe in the long-term growth potential of the business will shrug off the volatility and focus on sales of the company's drones to the military. Meanwhile, the company has the opportunity to use military technology in commercial applications. On the other hand, the decline in October is a salutary lesson in what happens when the market takes risk off the table, and as a consequence, it makes sense to only buy/hold the stock if you are prepared to stomach market volatility.